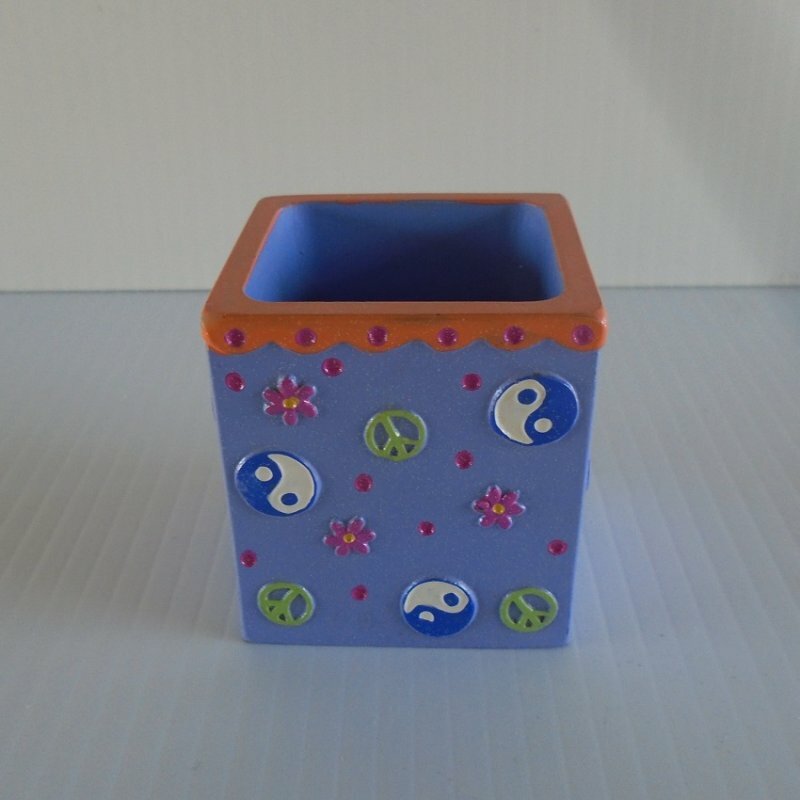 Lavender in color, this Claire's ceramic box features peace signs and flowers. 2.25 inches square. Estate sale find. This groovy little peace sign box is signed on the bottom "Claire's". Other printing on the bottom says #12 and 2004. There is a partial sticker on the bottom that may be covering other printing. The box measures 2.25 inches square. The base color is lavender with peace signs in the colors of green, purple, and white. There are also small flowers. Some possible uses could be as a trinket box for small items, or to set your jewelry in at night. It could also be used on a desk to hold pens, pencils, paper clips, tacks, etc. I purchased it at an estate sale. There is no breakage or chips in the material. I have not cleaned the box, you will receive it just as I did. Buyer to pay $5.80 USPS First Class Mail Parcel postage charges. Shipping is from Arizona. Every January the postal service increases shipping charges. Previously, shipping charges were based solely on weight and a package cost the same amount regardless of where it was being shipped to in the United States. This year they went a bit overboard. Now, with this year's increase, the postal service has divided the United States in to 8 zones and all packages are charged by weight, size, and destination zone. Now it is not possible to state a shipping cost and have it be valid regardless if the package is traveling 2 miles or all the way to the east coast. This latest increase has added an additional .46 cents to up to $1.43 on packages. I try to absorb some of the new charges but that's getting harder with each increase. To complicate things even further, Google will not show items for sale unless they have a designated cost, or unless the seller uses calculated shipping. My web host is not equipped to figure calculated shipping, so I have to quote a shipping charge using the east coast as the final destination and then refund over payments. When I return the overage, I usually do so by including cash inside the package when it's shipped. My feedback page will show verification that I do return overpayments.